Completely remodeled, luxury, plush, DIRECT gulf front, large balcony, RELAXING! The entire interior of Chateaux 406 has been completely remodeled! Decorated contemporary, from the leather furniture and marble flooring throughout to the glass door walk in shower. and a TV in the bedroom. Large sliding glass doors from the living room open up to a large balcony overlooking the beautiful beach and evening sunsets. Brand new KING SIZED mattress (AUG 2017) in Bedroom. There is also a double futon off of the kitchen. There is a large flat screen TV and DVD player in living room...additional flat screen TV in bedroom. Swim in the large pool, that lies conveniently, along the beach. There are coin operated washers and dryers located on the premises. Sorry...Pets are not allowed and all units are non-smoking. About Chateaux 406: White sandy beach with large heated pool, short walking distance to a bevy of good restaurants, private parking under building and near many major attractions. Close to Tampa Bay / Clearwater / St. Petersburg area. Amenities: Large Balcony off of the living room looking directly out to the beach. FREE WI-FI, large flat screen TV in living room and 2nd TV in bedroom, also a DVD player, Central A/C, cable, telephone. This very spacious condo offers a comfortable bedroom with a KING sized bed and a double futon off of the living room. All linens/towels furnished. Fully equipped kitchen, including microwave and dishwasher. Activities: Public tennis courts across the street at City Hall. Golf resorts nearby. Johns Pass just 10 minutes South of Chateaux on Gulf Boulevard. Area: Chateaux building recently renovated, new paint, new pool deck, looks beautiful. Indian Shores Beach has wide sandy beaches, walk for miles in either direction. Remember, 'if you book it, you can come'... and enjoy our Sand, Shells, Sea, and Sizzling Sunsets at 'The Sea of Love', The Chateaux on Indian Shores Beach. 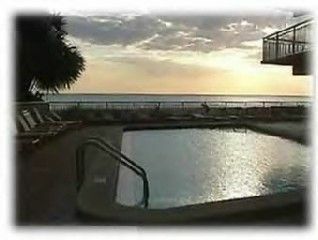 Keywords: Premier, One bedroom, one bath, newly renovated, Gulf Front, Indian Shores, private balcony, Gulf of Mexico, Upscale ,Tommy Bahama, King size bed, Cable, Television, DVD, Washer/Dryer on floor, Salt Rock, Free Wireless High Speed Internet. Condo completely renovated from top to bottom...absolutely stunning! Completely remodeled, bath has a glass enclosed shower with glass door. There is a step up into the shower. Large balcony from living room looks DIRECTLY out to beach! Living room consists of a leather sofa and love seat, flat screen TV., futon off of kitchen and dining room table adjacent to kitchen. Direct Gulf front condo on Indian Shores beach, sleeps a small family of 4 comfortably, recently renovated condo from travertine marble flooring to granite kitchen counter tops... pool beachside, reserved parking spot for this unit, shopping, restaurants nearby, enjoy sunsets from private balcony. Fully equipped kitchen, coin operated washer and dryer on premises. Enjoy shelling, swimming, beach walking, Chateaux, 'Sea of Love' condo... close to Johns Pass. Indian Shores Beach is located between Clearwater Beach and St. Pete Beach. Catch the trolley service just out front and ride up and down Gulf Blvd. for a nominal fee.